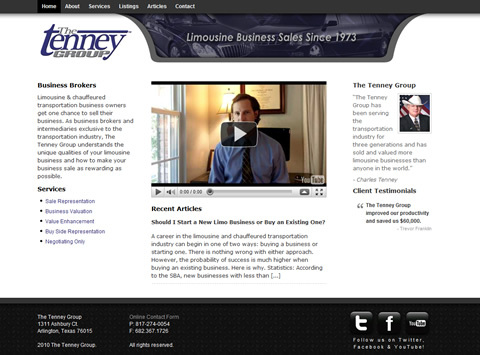 The Sozo Creative design team recently launched several lead generation websites for a transportation business broker. The sites were launched in conjunction with a new corporate website which was developed by one of our partners, nvisionative, a creative agency based near Charlotte, North Carolina. The agency partnered with our team for the design & development of the lead generation sites along with content marketing and search engine optimization. One of our graphic designers, Jessie Campbell, developed the framework & design for the lead gen sites per the client’s specs. Each lead generation site is built on a popular content management system using a flexible, customized theme. The copy was provided to us by the client for each site. The news section of each lead gen site permits a regular stream of articles to be written by the client and published, providing search engines and visitors with fresh fodder. The YouTube embedded video on the homepage can be easily swapped out for a fresh video with just a minor code change. We’ve developed a total of 4 lead generation sites with 3 launched to date and the 4th awaiting some additional content before launching. Each is built on the same design which somewhat mirrors the design of the primary business website (i.e. the mothership). Each lead generation site targets a specific audience and will equip that audience with business broker related information tailored to that audience as the client posts articles to the news portion of the sites. The first lead gen site (limobusinessforsale.com) targets limousine business owners searching for industry related consultants who can assist them with the valuation of their business or with buying or selling a chauffeured transportation business. The second lead gen site (ambulancebusinessforsale.net) targets ambulance and medical transportation business owners desiring to increase their fleet through acquisition of other related businesses as well as those in need of professional assistance in determining their business’ value and/or in helping locate qualified prospective buyers. The third lead gen site (truckingbusinessforsale.net) for this business broker targets those in the trucking industry who want to purchase or sell a trucking business. The fourth lead gen site (houstonbusinessbrokers.net) targets a specific geographic region where this particular business brokerage offers services to transportation related businesses. We hope to have this final site launched shortly. Each lead generation site is equipped with a contact form to generate leads directly as well as funnel traffic to the primary business website. In conjunction with developing and launching these lead gen sites, we’ll be conducting content marketing strategies to drive traffic to these particular sites. The end result will be an increase in exposure for this business broker’s sale listings as well as new leads for their informative monthly email newsletter and consulting services. Facebook is an awesome alternative for generating business broker leads on tap. It’s one thing to reach out to people looking on business sales sites, but that is only a small population of the buyer and seller market. Facebook reaches out to people, if you know how to best leverage it, and get them coming to you as buyers and sellers.